Better late than never! She is almost 11 months now! 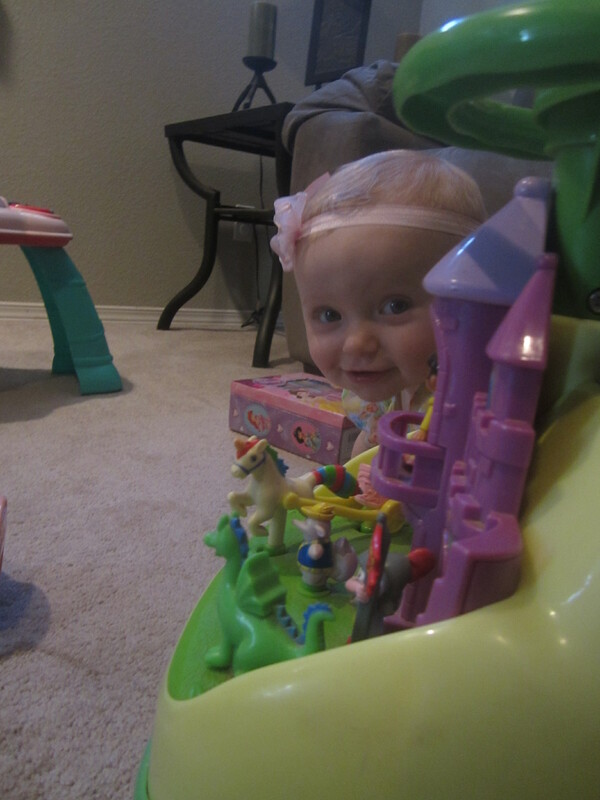 Favorites: FOOD, her car, Monks, books, sleeping on mom, and making messes! Lifesavers for Mom and Dad: Her little car that someone gave to us. 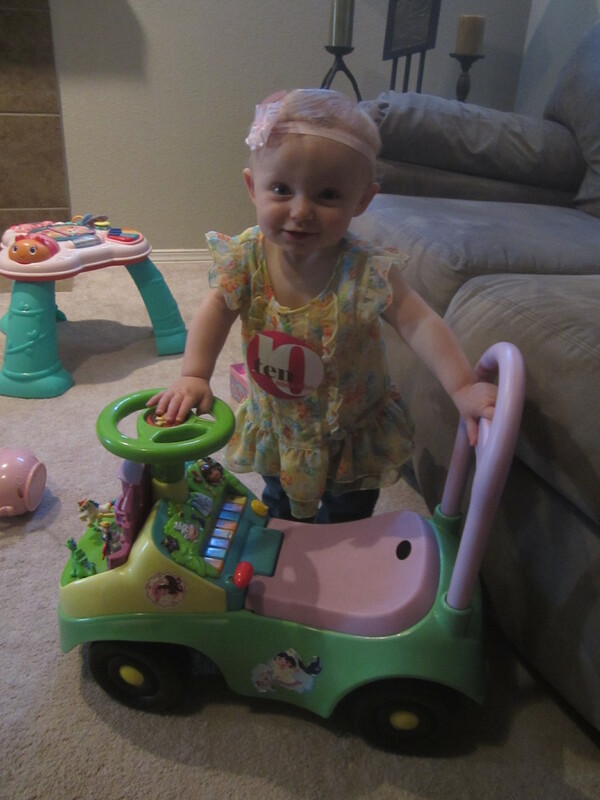 She loves to play with the wheels and move it around, and especially loves when dad pushes her around the house in it. I love her jogging stroller and use that thing almost every day! Facts: Wow. So much has happened in the last month. 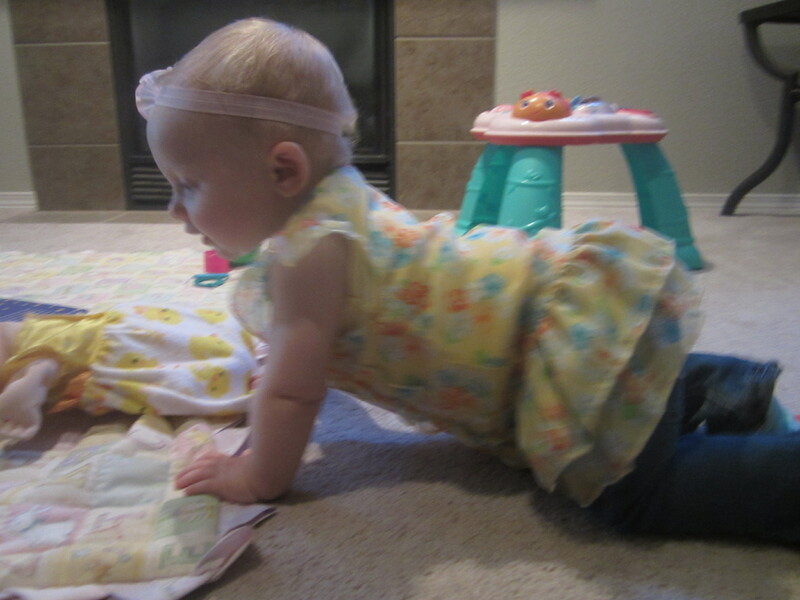 People are right that when your kid starts to crawl, you pretty much need to make sure everything is picked up. Her little pincer fingers are doing their work. I have to vacuum every day. Also, my shelves are getting cleared off pretty well too. She loves to play at the back door with the curtain. She is EVERYWHERE. Church is like a workout. We flew to Vegas and having her sit still on my lap was a real treat. She is so expressive. She laughs a lot more and is so smiley. She loves it when dad makes car sounds. She follows you around the house wherever you go. She LOVES Barney and every other animal she sees and makes sweet sounds to other babies and kids to get their attention. She sings in her car seat while we drive around and loves to go shopping and sit in the cart. Sleep Habits: Ugh. If I had one complaint, this would be it. She fights the crib. I let her cry it out, but when it starts hitting a long time, I go in (not picking her up) and try to console her. She is one stubborn girl who wants her way. I have read every book about it. Doctors Visits: Not until her year appointment. After looking at the 9 month questionnaire and worrying about all the thing she couldn’t do, she sure has caught up and does all of those things and more! Eating Habits: Has a bottle before naps and bedtime. She eats so much!! She loves food and practically everything I give her. I don’t bother with baby food anymore because she has so many teeth! Milestones: Crawling like crazy, standing with support, stood for ten seconds on her own, started clapping, repeats sounds you make (like raspberries, motor sounds, cat’s meow, mama, and dada), has six teeth. 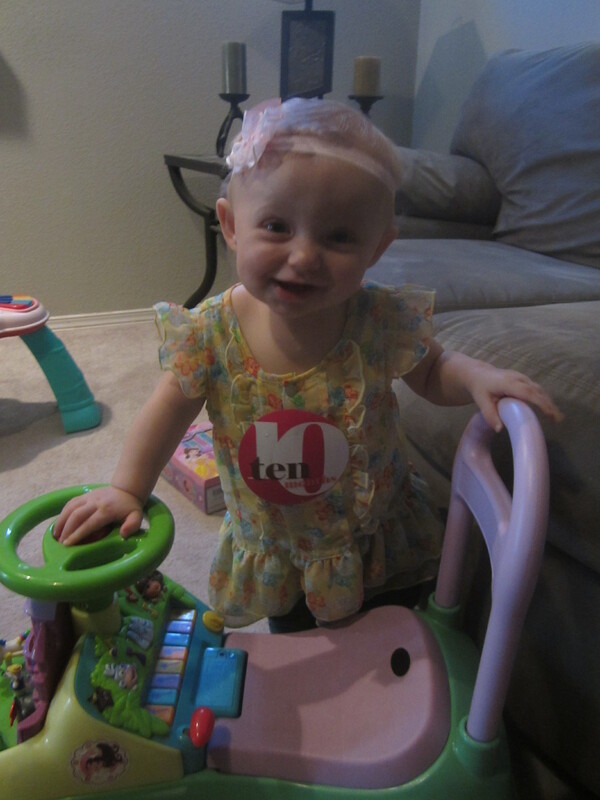 Looking Forward To: Watching her hit more milestones! This last month was so crazy!